The British photographer John Deakin was born on the Wirral peninsula near Liverpool on 8 May 1912. Around 1930 he left for Ireland, and in Dublin he took various jobs including one as a window dresser for a display company. He travelled to Spain to paint its landscape but returned to Britain in the early 1930s where he settled in London. An introduction to a wealthy American art collector ensured that, as his companion, he could travel the world and paint. Deakin first picked up a camera in Paris in 1939 - it had been left behind in an apartment after a party - and exposed a few frames. He spent much of the war years in Malta as a sergeant in the Army Film and Photography Unit. He then took photographs for a living for the next two decades, before abandoning it in the sixties. He worked at Vogue as a staff photographer, from where he was sacked, twice. While there he shot mostly portraits; his subjects were the writers, artists, poets, actors and popular entertainers of the early post war years: among them, Eugene Ionesco, WH Auden and Yves Montand, Picasso, and Dylan Thomas. His best portraits, however, were those of his friends, most of whom inhabited demi-monde of London's Soho, the lure of whose merry-go-round of pubs, clubs and parties led him away from permanent employment. 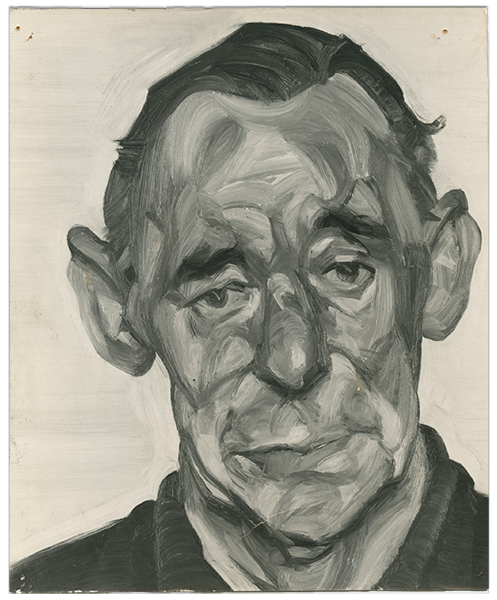 Sitters included the painters Lucian Freud, John Minton, Francis Bacon, the 'two Roberts' Coloquhoun and MacBryde, the poets W.S. Graham and Paul Potts, and the formidable proprietrix of the Colony Room, Muriel Belcher. His photographs made no concessions to vanity - after pushing the contrast in his prints to its maximum every pore and blemish was exposed in intimate close-up. His large-scale portraits have been recognized, belatedly, as his triumph. Additionally, his evocations of the street life of three European capitals, London, Rome and Paris are affectionate and sympathetic, taken just for himself, the opposite of his occasionally brutal portraits. The frontality of his composition and his very lack of "style" set him apart from his contemporaries and anticipated by at least ten years the fashionable starkness of Richard Avedon and Diane Arbus. Deakin steadfastly rejected the values embodied in the cult of the star photographer, but against his expectation he is now seen as a key figure, increasingly recognized by the photo establishment. He maintained a place in Bacon's circle through the sixties, stopped photographing and returned to painting, as well as collage and papier-mâché, but it came to nothing. After surgery for lung cancer and one last drinking bout, Deakin died from heart failure on 25 May 1972 at the Old Ship Hotel, Brighton. In 1984 The Salvage of a Photographer, the first exhibition of Deakin's work in over 30 years, took place at The Victoria & Albert Museum, London, curated by his friend Bruce Bernard.